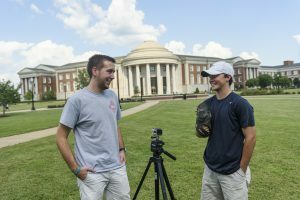 TUSCALOOSA, Ala. — Great ideas begin with questions, and for a University of Alabama student, his questions led him to an invention. 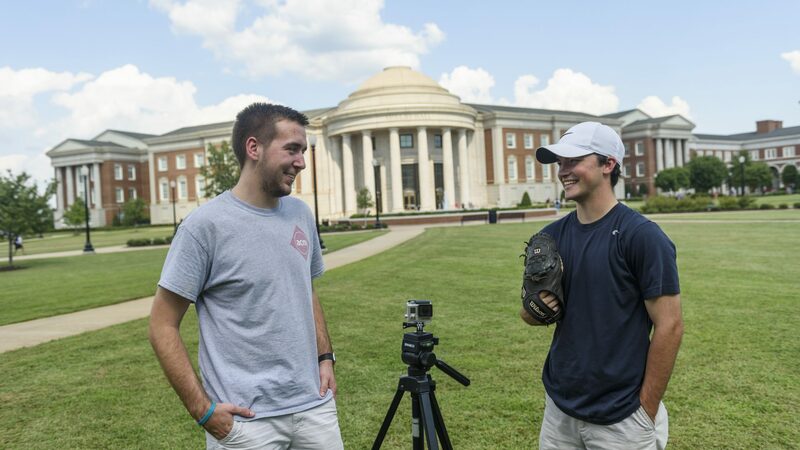 Now, Matt Bowen and some classmates are turning that idea into a company. “This has been way more than I could have ever imagined,” said Bowen, a senior from Huntsville. Bowen, who played baseball growing up and is an avid fan of the game, wondered why couldn’t he and countless other youth and recreational players have the same technology as the big league players and broadcasters. The answer he provided to himself — they can. Professional and other high-level baseball players and teams use cameras and computers to record a pitcher throwing the ball, analyzing that data to improve performance. Sports broadcasters use the technology to create video-game like graphics that show viewers a pitch’s speed and placement over the plate. It is an expensive technology, often out of reach for families hoping to help junior get that curve ball into the strike zone more often than not. Bowen, who studies computer science at UA, thought he could create a similar system using smart phones and laptops. As part of the UA Emerging Scholars Program, Bowen was paired with Dr. Jeff Gray, professor of computer science, his freshman year. The program provides freshmen with the opportunity to create research partnerships with UA faculty. “I got to pick a project I wanted, so I saw the strike zone technology on TV and said, ‘I want that,’” Bowen said. He wrote the code for what is now called Pitch Analyzer, which uses a camera on a smart phone or other high-res cameras to track a baseball as it travels from the pitcher to home plate, allowing the application on a computer to display the speed of the pitch and the ball’s place in the strike zone. As a mentor to several Emerging Scholars, Gray helps students take what they learn in the classroom to a more practical application. Bowen was different, he said. For one, he came from Bob Jones High School near Huntsville that offers computer science classes. Two, Bowen had the idea for the pitching app from the get-go and did not need help finding a project. Seeing the value of the application, Gray got Bowen to several computing conferences, including the nationally-competitive Association for Computing Machinery Student Research Competition in 2015 where Bowen placed second for his work. The conferences helped Bowen discover the possible value of the program, and helped him refine his presentation, Bowen said. 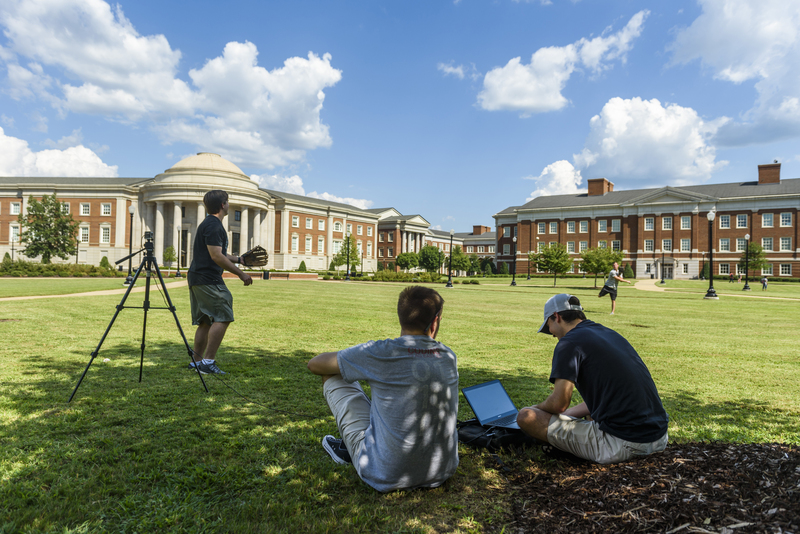 Zarobsky, left, and Bowen, work on a software program that can analyze baseball pitches on the Shelby Engineering and Science Quad at UA. Earlier this year, Bowen and two of his friends in computer science formed PA Software, a company to sell and market the Pitch Analyzer. Jacob Zarobsky, a senior from Chicago, Illinois, and Andrew White, a junior from Louisville, Kentucky, worked to set up a cloud database to store the information created from the pitches for customers, allowing users to find trends in the data over a longer timeline of pitching sessions. “We added that as a service to our customers,” Zarobsky said. Also on the team is Will Bowen, who graduated in 2014 from UA with a degree in aerospace engineering and works in the Huntsville area. He is also Matt Bowen’s brother. In August, the group filed for a patent, and received support for a private investor who found PA Software while searching for similar intellectual property. For now, PA Software offers the program for laptop or desktop computers that work with a mobile camera, but the next steps include refining the application to use on Apple iPhones and developing the application for Android-based systems. Bowen has also created and filed a patent for a similar program for hitting, so the team is improving that application to be sold. Bowen did not come to college to start a business, but the lessons he and the team learned along the way have been invaluable. “It’s a lot harder than it looks, but if it were easier, everyone would do it,” he said.